The internet is full of corporate vision, mission, and value statements. What all of these statements contain can be ennobling at best, and downright bland and meaningless at worst. What each part should include is also a mess: one company’s mission is akin to another’s vision. Often it is impossible to even tell two companies apart based on their visions and missions, and at worst it can even be impossible to figure out what business they are in, when the statements are sufficiently general. In this post, I will examine some aspects of these statements and their roles in a world characterized by change and multiple cultures. I will also propose a framework that is internally coherent and brings these statements to a practical and usable level. If you ask young men what they want to accomplish by the time they are 40, the answers you get fall into two distinct categories. There are those -the great majority -who will respond in terms of what they want to have. This is especially true of graduate students of business administration. There are some men, however, who will answer in terms of the kind of men they hope to be. These are the only ones who have a clear idea of where they are going. The same is true of companies. For far too many companies, what little thinking goes on about the future is done primarily in money terms. There is nothing wrong with financial planning. Most companies should do more of it. But there is a basic fallacy in confusing a financial plan with thinking about the kind of company you want yours to become. It is like saying, “When I’m 40, I’m going to be rich.” It leaves too many basic questions unanswered. Rich in what way? Rich doing what? These words remain as useful a guide today as they did decades ago. And in this mood, let’s dive into the world of vision. In a dynamic world, it is difficult to articulate what you want your company to be like in, say, 20 years, at least without resorting to such generalities that the vision becomes almost meaningless. Some companies, however, articulate their vision in terms of what they want the world to be like, without being specific as to what their exact role in bringing about this world is. This approach to a vision statement enables the company’s strategy to change, even radically, without compromising the ultimate vision. If you use a vision statement to state what you want the world to be like, then the question on the role of your company still remains. In a changing world, the time of long-term mission statements is perhaps over. It makes more sense to focus on the near-term, on what the company is doing in order to bring about its vision right now. In The Strategist: Be the Leader Your Business Needs, Cynthia Montgomery proposes to call this statement a purpose rather than a mission (the term mission can then stay reserved for a long-term mission, should you find yourself in need of one). IKEA, for example, has a powerful purpose: “We shall offer a wide range of well-designed, functional home furnishing products at prices so low that as many people as possible will be able to afford them.” This statement tells exactly what IKEA is doing right now to fulfill its vision of a better everyday life for the many people. Should IKEA find that this purpose no longer serves their vision, they could change their purpose, and the whole company, to do something else that does promote their vision. Montgomery tells about a question she asks each of her MBA classes: If your company disappeared today, would the world be different tomorrow? A company with a solid purpose will be able to answer yes, the world will indeed be different. If we compare this list to IKEA’s purpose, we can see that it fulfills all four: offering good products to as many people as possible (ennobling); well-designed, functional products at low prices (stake in the ground, distinct); and both of these together set the stage for value creation and capture. I am a little allergic to value statements. In many cases, the value statements are so generic and repetitive that you can browse through dozens of companies without finding anything that would set them apart. A further issue is that in a multicultural world, how accurately do we share the exact same values? This actually does not even need a multicultural world to be true. Let me illustrate this point with a small venture into the realm of moral philosophy. For centuries, Western moral philosophy was a battlefield between two schools: deontological ethics (the position that the morality of an action is based on its adherence to a rule) and teleological ethics (the position that the morality of an action is based on its consequences). However, in most cases, perhaps even in all the circumstances of a regular person’s life, these schools gave the same answers as to what is the right course of action. The exact same behaviors can result from completely different values. Therefore, what is the point for a company to decide on a set of values? Instead of values, a company can tell about certain behaviors its employees will exhibit. This is far more tangible for a customer as well, as then the customer knows the sort of behavior he can expect in dealing with the company. These behaviors are what I call manners. Sometimes companies go for both, and define a set of values and also behaviors based on those values. However, this is redundant and even harmful, because it sets the stage for disagreement on whether certain behaviors should result from the published values and if there is such conflict, it can become necessary to ditch something from the system. It also sets the stage for disagreement on the values themselves, even if there is an agreement on the behaviors, and thus creates a completely unnecessary conflict over matters that would not be visible in the daily life anyway. I will illustrate this with another, a bit risky (because it’s based on religion), analogy. If you observe the daily life of a Christian, a Muslim, and an atheist (not counting actual religious practice), it is unlikely that you can tell them apart. They may not share the same values, but they share many of the same manners, and this is the area a company should be interested in. Vision for the world, what is the world you want to work for. Purpose for the company, what is the company doing in order to bring this world about. Manners for the individual, how do people go about in daily operations. A company is usually expected to turn in a profit. Even if it is not, it has some limits set on it from its owners. Of course, the owners might have also defined the company vision, but even in that case there are usually some other requirements from their end. Purpose, on the other hand, is malleable. There are many ways to work towards an ideal world, and a company needs to pick one of the profitable ones in order to exist in the long term. 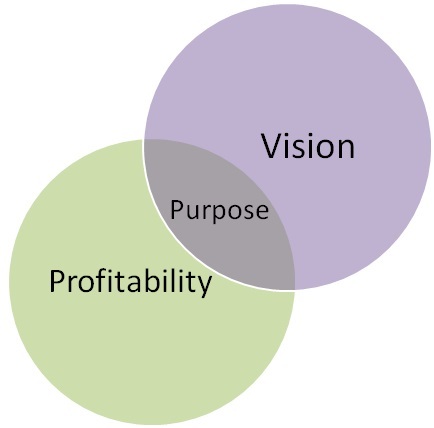 This is how vision guides any strategic planning, and is why vision is the first thing that needs to be clarified in order to create a strategy. As mentioned in the beginning of this post, there are many, many ways to define visions and missions. The framework presented here is not inherently any more correct than some other framework. The reasons I promote this one is because it is internally coherent (all the parts support and enhance the other parts) and it is more tangible and actionable than most frameworks I have seen. With this framework, you can turn ideas into actions. That is pretty much by itself.